ONE OF THE ‘big four’ accounting firms has announced that it plans to hire more than 500 extra staff across Ireland over the next year. 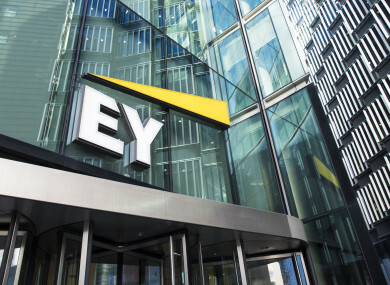 EY said it expects to take on 215 experienced hires and 305 graduates across its seven offices in Ireland, adding to its existing total headcount of more than 2,500. The majority of these positions will be based in Dublin, with 340 jobs in the capital, while the rest of the workers will be spread across offices in Belfast, Cork, Limerick, Galway and Waterford. Frank O’Keefe, who was appointed as managing partner at the start of July, said that this announcement is a “real show of the growth” that EY Ireland has experienced in recent years. The consultancy last year reported fee income of €247 million, a 12% increase on the €220 million it took in the previous year, although its local revenues still trailed those of rivals PwC, Deloitte and KPMG. “We’ve increased our headcount over the past two years by 36% because our business is growing,” O’Keefe told Fora. The new jobs will be based in these emerging areas, as well as the firm’s core practices of audit, tax and corporate finance. As part of its hiring drive, EY will be increasing its graduate intake significantly on the number of similar positions it filled last year. In particular, the company is also starting to look for more graduates with STEM backgrounds. “We’re very much still looking for business or accounting graduates – more relevant or traditional degrees as we’d call them,” O’Keefe added. “But as part of our graduate intake this year we’re also looking for those STEM skill sets. Those graduates will get a huge breadth of experience working with all different types of clients across our business, so they can really build their experience in their area of choice. With over half of the new positions based in Dublin, O’Keefe said that he’s aware of the challenges of recruiting people in the capital, where rents are continuing to rise. “For graduates, we introduced a rental allowance in 2017 for people based in Dublin. That’s really important so that they can sustain a lifestyle even in their early career years as they grow in EY,” he said. O’Keefe added that EY has refurbished all of its offices in the last few years, so the company now has the office space to take on the additional staff over the next 12 months. Email “One 'Big Four' firm is taking on 500 new staff - and more than half will be graduates”. Feedback on “One 'Big Four' firm is taking on 500 new staff - and more than half will be graduates”.